"Stephanie is a great partner to have if you’re looking to buy, rent or invest in real estate. Thank you for you invaluable advice and thoughtful insights. Looking forward to working with you in the future." "Stephanie, was a HUGE help for my family and I. She got us our dream home and everything we desired. She was very knowledgeable and helped us through process and made everything so comfortable. Her negotiation skills came in handy to get the exact deal we wanted for our budget. She would not back down and was our “bull dog”. Thank you Steph! We will use you again in the future." "I am a young first-time homeowner who went into the buying process for a Brooklyn Co-Op pretty much blind. Stephanie was there every step of the way to ensure I was informed, kept up to date and kept at ease. Without prompt, she recommended lawyers and movers who were stellar. We put together a board package in less than two weeks - a very quick timeline due to my own time constraint - and she worked relentlessly to expedite the process with building management to meet my timeline. Above all, Stephanie was a pleasure to work with - friendly, knowledgeable and truly passionate about her work. Buying an apartment in NYC can be an ordeal (a Co-Op especially); I'm thankful I had Stephanie to guide me through!" "Stephanie and I were connected through a co-worker who also worked with her in the past few years. After 8 months of looking on my own, I found the process of purchasing real estate in this city exhausting but working with her made all the difference. She was honest, kind and very knowledgeable. At first I was looking at only new development and then she pointed out some really nice turn key properties that did not have the risks and high upfront costs of new development. She saved me a lot of money and put me in touch with her team who worked in sync from the start to the closing table. When you work with Stephanie you are working with a professional, I highly recommend her." "Stephanie showed me a few places in the battery park/TriBeCa neighborhoods. I've had a few realtors show me places before but Stephanie was the most knowledgable and well mannered. Her kindness and hard work ethic was truly rare to find. She went over and beyond to find me a place which was comfortable and exactly what I had asked for. I will most definitely use her in the future with all my real estate needs." View more testimonials on my LinkedIn page! 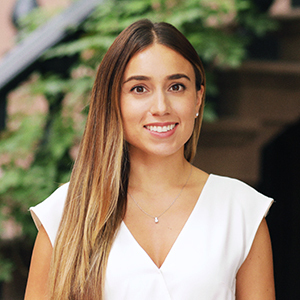 Stephanie Betancourt is the ideal real estate partner to have on your side when the time comes to buy or sell a home in New York City. This native New Yorker was raised in an active real estate family, with a father who owned a construction company for over 25 years. Her background in the world of residential real estate, and working on Wall Street in the financial sector affords her unique skills, knowledge and perspective that alludes the typical broker. Stephanie offers her clients guidance on all aspects of real estate, from the financial implications of buying or selling to the work and cost involved in renovations, to the best quality and value in a resale or new development. She is extremely astute when it comes to listening to her clients’ needs, thinking outside the box, and finding creative approaches to meeting their goals. Her deep understanding of contracts and negotiations are second to none, with a keen focus on details and protecting the interests of each individual she represents. “I treat my client’s investment as I would treat my very own. My commitment lies in delivering the absolute best advice and highest-caliber service to those who put their trust in me as their real estate professional.” It’s no wonder she enjoys glowing reviews from loyal clients who are happy to take time out of their day to describe the great experience they’ve had working with her. A graduate of Pace University, Stephanie received a Bachelor’s in Finance and Business Management and went on to hold positions at large financial firms such as Societe General and BPD Bank, a subsidiary of Banco Popular where she managed an asset portfolio of $450M. She has lived in Gramercy and the Financial District, until moving to Long Island City which she presently calls home. Fluent in Spanish, Stephanie also spent a year in Spain and loves to travel when time allows.